Visiting a school is the best way to see the facilities and resources, meet instructors, talk to current students and get a feel for the campus. While most campus visits involve sitting and listening to various speakers and then touring the campus with a large group of people, we do things a little differently at NUHS. A visit to National University is a unique experience with many hands-on, interactive opportunities. 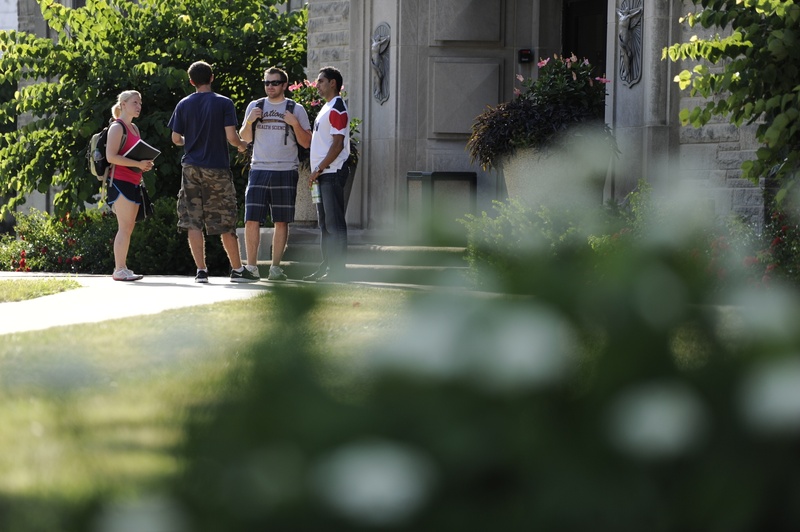 If you’re considering NUHS, Summer Soak-Up is the perfect time to visit our campus. Visiting NUHS this summer will help you earn tuition credit towards your first trimester before ever signing up for classes! We have many visit opportunities available throughout the summer including group visits, student-for-a-day events, and individual tours that can be customized to your specific schedule or preference. Regardless of the type of visit you choose, every student who visits before August 31st will be eligible for double tuition incentives. That means a $1,000 tuition credit towards the first trimester in one of our graduate programs, or a $500 tuition credit towards the first trimester in our undergraduate and certificate programs. Summer is the perfect time to visit NUHS because you’re probably already off school. This means you can take your time exploring and getting to know the campus. Plus, the weather is beautiful this time of year at both our Illinois and Florida locations. With two sites that are just a short drive from major cities (Chicago and Tampa), you can make your visit into a mini-vacation and experience all their entertainment and attractions. You can learn a great deal about National on our website, but there are some questions that can’t be answered without seeing for yourself. If you want to be fully informed about our programs, requirements, financial aid, the admission process, and culture, visiting the campus and talking face-to-face with students, staff and faculty is the way to go. Meeting with these individuals gives you the chance to ask the questions that are most important to you and start to build relationships with the people who will be there to help guide you through your education. By talking with current students, you’ll be able get a first-hand account of how to succeed in a rigorous medical program while still maintaining balance in your life. Do you prefer a hands-on approach, or do you learn better through more traditional, lecture-based classes? Health care programs can be rigorous and challenging, so it is wise to make sure the school you choose enables you to learn to the best of your ability. When you visit NUHS, you can sit in on a class lecture, shadow an intern or clinician, and meet with students and faculty members, in addition to touring the campus and facilities. You’ll be able to experience our learning environment first-hand, and determine how our teaching practices mesh with your learning style and preferences. A university’s facilities and resources can have a big impact on your education and experience. And there’s no better way to gauge the classrooms, labs, clinical and library resources than to see them in person. By visiting NUHS, you can explore our various academic facilities which include a top-notch Gross anatomy lab, Whole Health Center (on-campus clinic), Training and Assessment Center, Herbal Dispensary, Botanical Garden, Learning Resource Center, Anatomage Table, and the state-of-the-art Hydrotherapy Suite. When you choose a health care program, you’re choosing to spend a significant amount of time on and close to campus, so it’s important to consider the university’s amenities and living options. Our Illinois campus houses a fitness center, well-equipped with treadmills, stair climbers, exercise bikes, free weights, exercise balls, and other training tools. National University’s Illinois campus offers convenient on-campus housing including studios, one-bedrooms, and two-bedroom options where students can live individually, with roommates, or with their families. Those who desire to live off-campus have a variety of near-by housing options available. By attending a visit event or scheduling an individual tour this summer, you can explore any and/or all of these facilities, resources, and amenities in detail and make sure they meet your needs. Experiencing the feel of a campus and student life is one of the most important considerations when choosing a school, yet hardest to articulate and understand over phone or email. You want to choose a school where you feel comfortable and able to make use of the resources provided to you. In order to get the real feel for the campus atmosphere, physical environment, and student life, it is essential that you visit. This will enable you to get a good sense of the environment and students’ passion and enthusiasm toward their program and the school itself. The faculty and staff also influence your overall experience, so it is important to meet them too and better understand the folks who will help you navigate the program successfully.